These distances on a fixed gear, were something new to me, and by the end of each day there was a feeling that I had done my day's work. In addition to the distance covered, each day, there was also some climbing involved. Although everyone had assured me that Iowa is completely flat, the 11,000 feet of cumulative gain (for the entire ride) were indeed noticeable. 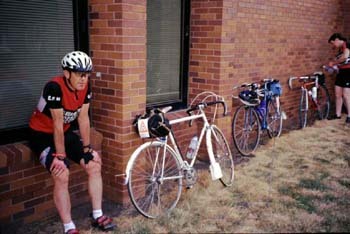 What had started out as a laughing chat among three old friends via email in January, materialized in three tickets to RAGBRAI (Register's Annual Great Bike Ride Across Iowa), sponsored by the Des Moines, Iowa, Register newspaper, taking place July 21-27, 2002. This was the 30th edition of this legendary cross-state ride and we were The Sultans of Spin fixed gear team: Pat Marek (67.5"), Duane Wright (67.5"), and the undersigned, Genny Gebhardt (64.5"). 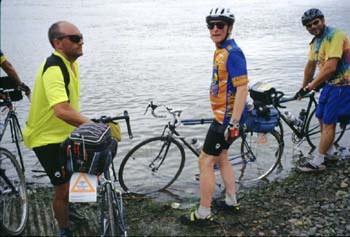 I was the only one to have done any touring on a fixed gear, and although the tours had been short, I had ridden a fixed gear for many years. This was well, as Pat and Duane are both extremely strong riders, Duane being a tireless and long-time randonneur, and Pat a cog-rippin', wheel poppin' hillmeister. I banked on my good spin(!) and muscle memory to accomplish the advertised 480 miles cross-state, as my fitness was basically "ride to work most days and Saturday morning chain gang", comprising maybe 100 miles a week if I lied. If it has wheel(s) you'll find it on RAGBRAI -- I've never seen such a complete collection of wheeled, human-powered vehicles on a ride. RAGBRAI is a ride like no other. 10,000 people at a minimum, with locals jumping in and out at various spots along the way, and some estimates to 30,000 on the road. It's a rolling party, a mobile rave, a festival of bicycles, unicycles, weird costumes, party busses, Midwest food, farms, fields and vats and vats of Bud Light, probably the worst beer on earth save when you're riding 70 miles a day in 90 degree heat. People crash on lawns, sleep in enormous campgrounds, pass out in cornfields and swell to bursting tiny, sleepy farm towns, decorated and freshly paved for the occasion. RAGBRAI has its own hallowed traditions: Mardi Gras beads, body painting, naked water slides, burly guys in tutus, party busses with mobile beer gardens, and more food than you can imagine. The organizers provide gear transportation, maps, Kybos (Midwestern for Porta-Potties) and outstandingly diligent oversight and emergency support (the director actually drove 20miles out of his way to retrieve my driver's license, which I had inadvertently dropped at a rest stop). You find your own food, but it's everywhere as towns and farm families turn out for the occasion with booths and mobile kitchens. 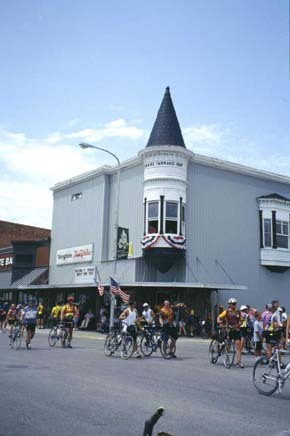 The friendly, good humoured Midwesterners love to tour, and show up in their thousands, some riding their 25th edition, along with people from every state in the Union and as far away as Italy. They ride racing bikes, unicycles and every imaginable thing in between. They carry boom boxes and tow stereo systems behind on Bob trailers. Moms pedal along, grandpas in jeans or overalls on old mountain bikes hop in, young racer types hammer, fleets of kids on department store bikes ride pace line, their grins as wide as the Iowa sky. We fill the farm roads gutter to gutter in our inexorable march from the western border to the Mississippi River. In this good humoured mob ride your fixed gear riders. Iowa's terrain is custom made for the fixed gear, with flat to gently undulating terrain through beautiful farm lands and lush green hills to the east. nightly entertainment. One evening a symphony performed, another evening there was a musical. The night before day one there was a very impressive display of fireworks. 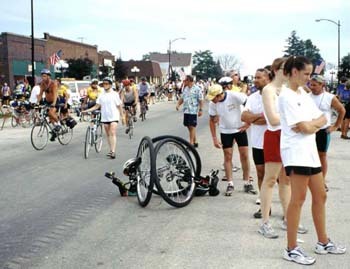 The route changes every year, and this year we began in Sioux Center on the eastern border of Iowa for our 54 mile warm-up to Cherokee, our first night's camp, passing through Orange City and Alton. Each day's pattern was alike, the variety provided by the people, the towns, the subtly changing terrain. Break camp at 5:30, on the road by 6:30, eat our way along the 60-80 miles, arrive at about 2:00 or 3:00 at the new campsite, clean up, have a couple of beers, then go into town. The day would have taken us through farm fields and towns, each one decorated for the occasion and with bands and festivals, food booths and displays. My favourites were the 4-H (young farmers clubs) kids who enjoyed showing their animals and manning their own fund raising booths frequently sweet corn pulled out of the field a half an hour earlier and thrown into the steam pot. The kids for me were one of the highlights of this trip. So were the towns. I was born and raised in small towns and had nearly forgotten that there were still places like this, places like where I had grown up, where people sat out on porches or lawns simply to chat, drink lemonade and watch the world go by, their friendly waves and cheerful encouragement speeding us onto the next town "Thanks for visiting us! Come on back now... !" American Gothic: A typical midwest downtown. Free enterprise springs up along the route, with impromptu signs announcing such things as "Pork Chops, 7 miles." ... Various efforts were made to attract the riders' attention. I was particularly amused by young church women in skimpy attire. Hot -- For people used to the gentle maritime climate of the Pacific Northwest, stepping off the plane in Iowa was like walking into a sauna. When we got off the bus at the starting town, the thermometer read 104 degrees (40 Celsius). With the humidity, the heat index was 112 (over 44 Celsius). We had visions of ending the first day of the ride as bubbling masses of protoplasm, but it cooled down to a more manageable low-mid 90s for that day. We found that we adjusted to the heat and humidity pretty quickly, helped by record consumption of Gator-Ade and water. The heat moderated from the first very hot day and stayed in the mid-80s to low 90s. Most of the nights were unaccustomedly warm to we Northwesterners, but Pat and I had two little fans going in our tent and a nice, cool bed sheet. Pat, Duane and I camped together, and sometimes all three of us rode together, Duane streaking along one moment, and the next moment disappearing to investigate a particular phenomenon. No one went hungry, hardly could you ride a dozen miles before roadside food stands popped up, each touting the heartiness of their fare. We ran across other fixed gears periodically, not everyone riding with brakes, and followed three 36" wheel Coker unicycles that floated surrealistically above everyone, the riders three young guys rolling comfortably along. There is nothing like riding a fixed gear, and in the warmth of a sunny Iowa summer's day, rolling freely along those smooth, gracious roads, it felt like flying. Every day was sunny, the roads smooth, the crowd endlessly fascinating, the bike seem to float beneath me. It was as close to paradise as I've come to on a road ride! None of the Sultans are desultory riders, but despite my lack of training, I had no trouble keeping the 18-21 MPH pace we tended to settle into between stops. Indeed, if there was one problem to riding a fixed gear on such flat and fast roads, it was the lack of standing that normally breaks up a fixed gear ride in our hilly Puget Sound area - as the week drew on, we all suffered from various forms of "fixie-bum." There is no cue sheet for this ride, and almost no one is carrying a map -- all you really need to do is follow the crowd! 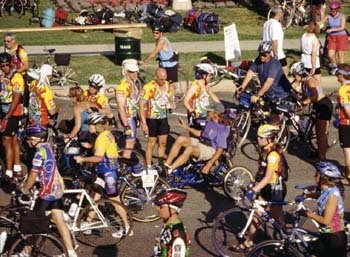 Crowds -- It was an awesome experience to see an unbroken mass of cyclists to the horizons ahead of you and behind you. It was like a vision of America where the downtrodden wheelpersons finally rose up and banished cars away from our presence. Riding in the crowds on a fixed gear was a lot of fun. I like traffic as long as I can work with it, and enjoy pack riding. These huge packs had a breakdown across the road, and most people stuck to the formula: slow riders to the right, medium riders to the middle, medium passing riders on the yellow line, faster riders on the left side of the road (never mind oncoming traffic, we saw perhaps 30 cars in the whole week, and only two were obnoxious), and the very fast riders generally racing teams on the very, very left. This made it easy to pass and move around, and never coasting meant that we had a smooth transition, particularly when the three of us were riding together, and was technically an enjoyable challenge, very reminiscent of a track race. During one memorable stretch I, unaccountably, found enough fitness to sit at the head of affairs and keep up a strong pace into the winds, including dropping several people. When at last we pulled into town, a very fit guy rolled up to us and, pointing to our fixed wheels said "Can you keep that up all day like this on those things?" Pat grinned: "If you keep feeding us." The winds sweep across western Iowa unbroken by hills or trees, and frequently were either dead on or side-head winds. In the crowd this wasn't noticeable, but as we made our way toward the head of the packs, we could feel them, and at times they were strong enough to necessitate getting into the drops. I would crouch on Pat's wheel while he drove along and soon would look back to find four, or five, or more geared bikes, generally sleek racers or performance bikes, on my wheel. Yet my experience, when I found myself riding solo into the head winds, was that the fixed wheel, perhaps because of the efficient direct drive, was easier to ride than a freewheel. Many times I would pass obviously fitter people than I who were struggling into the wind, shifting gears and pistoning. Once I ended up with about 25 "Killer Bees" a team of riders wearing black and yellow striped shorts and jerseys - on my wheel. Riding along on my fixed gear made me feel a little bit sneaky, or stealthy, if you will. Hardly anyone noticed my lack of gears. Most of the very few who did were surprised that the bike also had no freewheel. Then their eyes would get BIG and they'd say "You can't coast at ALL?" To the Midwestern mind, a bump in the earth is a coast-worthy hill. To the Northwest rider, a mile long 8% grade is a something you've still gotta pedal down. I had one amusing incident when I was riding solo and somehow got involved in a group of fitness type riders moderately fast riders on nice road bikes. I passed them on a gentle uphill grade, and somehow this incited them to chase. They stayed around me until the flat and then we began a long and rather steepish descent. I tried to stay out of groups like this on downhills because my top speed is about 31-32MPH, and due to some fatigue I was trying to keep my spin down a bit so I wasn't even achieving this. On the downhill they backed up behind me, then one of the women came up on my right and gave me a bemused look, and one of the guys came around on my other side with a barking "On your LEFT!" and they streamed around me. Ah, but on the next uphill grade, I caught them again, and as I drew up I heard one of the guys pontificating rather breathlessly "I mean, when I saw that, I said to myself 'That's crazy'!" He huffed. "I could hardly believe it! ... she's stuck in that one gear and can't even coast... " They were so busy listening to him that they didn't see me quietly pass and move off up the grade. In Anamosa, our last night, 55 miles from the Mississippi, the skies opened at midnight with a noisy thunderstorm cracking above our heads and unleashing a deluge. We rose at 5:30 in absolutely pouring rain, struck camp, stuffing our soggy tents into their bags, and saddled up, already soaked. It was cold and I had had to borrow a pair of tights, but fortunately had brought a Gore-Tex jacket. Cheerful Midwesterners laughed and chatted as they rode slowly along in shorts and garbage bags. I could see nothing, the rain driving into my face so hard that water was literally floating my contact lenses. A ghostly shadow splashed up to me it was Eric from Baltimore, riding comfortably on his brakeless track bike and asking me how it was going. He had to re-introduce himself as I was so blinded by the rain I could barely make him out. Nor could I see the road before me. We are very used to the wet here in the Puget Sound area, but we are not used to hard rain. It drizzles, it fogs, it mists, it clings and soaks, but it's what a Vietnamese co-worker of mine calls "small rain" versus "big rain" and this day we had BIG rain. We stopped for waffles in the morning, and I was too tired and cold to eat much. Pat adjured me to try to eat; he encouraged me to keep going when I spoke of quitting. I said my only problem was that I couldn't see and my eyes were sore from the rain. Word came through the waffle shack that some bozo had spread carpet tacks over the road and over 300 people had flatted. The organizers, on top of the situation immediately, had gotten the county's road sweeping equipment going and they were using a magnet to pick up the tacks. We could faintly hear it schussing over the streaming roads. Every single Iowan we had met had loved us but this person hadn't. I felt even lower. Yet, when we finally emerged, the rain had tapered off, the tacks had been swept, and Pat and I saddled up along with our fellow riders. Slowly the temperature rose, and from time to time a tiny bit of blue peeked through the clouds. The rain-washed landscape emerged in a beautiful rich array of greens the corn fields rolling into hillocks and wide tree dotted dales, the clouds banked up into the sky in mounting shades of grey, and all suffused with misty, pearly light. It was like riding through a renaissance painting. They say that Iowa is flat, but on a fixed gear the slightest undulation is noticeable. The last day had the hilliest terrain, the hills marching relentlessly along one after another - even Pat and Duane, both excellent climbers, were challenged. I am a rolleur and flatlander, however, and my climbing skills are generally more guts than glory. I would grind up one long hill in a head hanging struggle, then spin madly down the other side, only to attack the next one until I stalled, then start "rowing", my upper body levered over the stem, head down, hauling at the bars and rocking the bike from side to side. I had heartburn from eating weird food all week and spinning for hundreds of miles, and every time I got above 125 RPM on the downhill, I would feel as if I were going to explode and would have to lay on the brakes. Hill after hill I struggled over, and on one of the longest I was sure I'd have to get off and push. I couldn't stand the idea of it, and wailed and gnashed my teeth until I thought of Kent Peterson, our local fixed-gear Rando Great. Even Kent has to get off and push once in a while. True, it's on a mountain pass with a 71" gear, but still, if Kent, a far stronger rider, could do it, admit to it and shrug it off, then by golly I could get up off my egotistical keister and do it, too. At the point where I was ready to pull off and unclip, and join the line of cyclists trudging along the side of the road like the gold-rushers slogging over the Klondike, I heard Aretha Franklin's "Natural Woman" booming from someone's stereo system. The soulful beat was perfect for my slow cadence and her singing filled me with resolve. I kept going, on and on ("When my soul was in the lost and found... you came along to claim it... "), and on, finally up over the hill, and at that moment came The Emotions with "Best of My Love", and a blessed flat spot. Glory Be! There, too, was Pat waiting by the side of the road, vociferously cheering me in. And where was Duane? In true rando style, he had decided to extend his ride into Wisconsin to visit his family in Madison and attend a reunion, including a baseball game as God meant it to be played, on a grass field under the open sky. But to get to his own little paradise, he had to ride from the Mississippi, through Illinois and on to Wisconsin, so his family could hopefully pick him up. He had found a ride from Bellevue, our destination, to Illinois, but they were leaving at 1:00. This meant that on the last morning Duane wished us bon chance and hammered off, never to be seen again. We finally made it to journey's end in Bellevue under clearing skies, where the thundering herd rode into the Mississippi to dip their back wheels, smile, wave and mug for another's cameras, cheer, chug down another Bud or bottle of Gatorade and start to party. On this last day, with the rain, cold and hills, fully half the field had abandoned, but every single fixed gear that I've talked to finished. As I was wheeling my bike away from the river, a fit older man pushing a beautiful racing bike came up alongside me and stared at my bike. "Did you ride the whole day"? He asked, pointing to my fixed wheel. "Yes, I did." I answered. He looked sceptical. "You didn't walk any of the hills?" I eyed this well-meaning gent with a basilisk glare. "I did not." Said I. "I rode every wet, painful, bloody-minded INCH of every single hill, up AND down." He looked at me silently and then said "That's amazing." I had never done an organized tour before, and might NOT have done RAGBRAI, were it not for the suggestion to ride it on fixed gear. This aspect added a new dimension, an interesting challenge, making the ride a bit more difficult and therefore a bit more attractive. There's no escaping it; Iowa is covered with the stuff, and one field of it tends to look just like the next. We ate lots of it, as every town offered plenty of fresh sweet corn on the cob. Iowa has many beautiful, well-preserved towns... the old brick downtowns are still the center of the community. I saw more working downtown movie theaters in a week than I've ever seen in our home state. After corn, the most plentiful food on the ride. Iowans eat it in ways that I've never seen on the West Coast, like pork burgers, brat burgers and pork chops served on hamburger buns. An incredibly friendly lot. Every town we stopped in rolled out the red carpet. The campgrounds were often a good walk from the downtowns. The locals who were driving by would often stop and offer a ride when they saw riders walking along the road to or from the campgrounds. Many of the townsfolk opened up their yards for campsites or offered in-home stays for those who didn't like camping out.